Former Director of National Intelligence James Clapper said Tuesday that President Donald Trump asked him to "refute the infamous 'dossier'" detailing explosive claims about his campaign's ties to Russia, but he "could not and would not" do so. 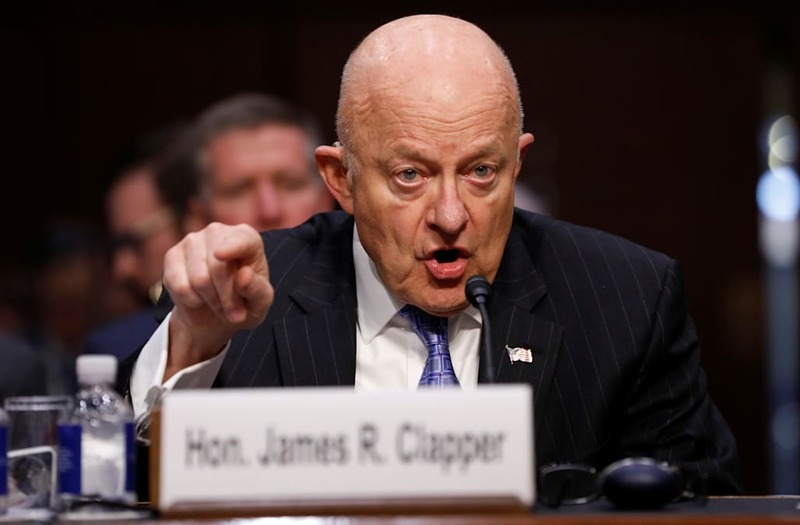 Clapper, who served under President Barack Obama from 2010-2017, described what he perceived as Trump's "internal assault on our institutions" in his disparagement of the US intelligence community and firing of former FBI Director James Comey. "The president-elect disparaged the Intelligence Community's high-confidence assessment of the magnitude and diversity of the Russian interference by characterizing us as 'Nazis,'" Clapper said during an interview with the National Press Club in Australia. Trump tweeted in early January that US intelligence agencies "allowed" the dossier compiled by former British spy Christopher Steele, and published in full by Buzzfeed, "to 'leak' into the public.'" "One last shot at me," Trump wrote. "Are we living in Nazi Germany?" Clapper said Tuesday that he "felt an obligation to defend the men and women of the United States intelligence community" after Trump's outburst. So, he said, he called Trump on January 11 and "tried, naively it turned out, to appeal to his 'higher instincts' — by pointing out that the intelligence community he was about to inherit is a national treasure." The president-elect, however, was only interested in one thing. "Ever transactional, he simply asked me to publicly refute the infamous 'dossier,' which I could not and would not do," Clapper said. Clapper released a statement on January 12, one day after speaking with Trump, saying he had simply informed the president-elect that the US intelligence community "has not made any judgment that the information in this document is reliable." But Trump described the call very differently, tweeting that morning that Clapper had called him "to denounce the false and fictitious report that was illegally circulated." Clapper, former FBI Director James Comey, former CIA Director John Brennan, and NSA Director Mike Rogers briefed Trump and then-President Barack Obama on the existence of the dossier in early January, CNN reported at the time. Some of the dossier's claims — many of which appear to align with events during the campaign— have been corroborated by the intelligence community. But many of its more explosive claims remain unverified. CNN reported earlier in March that the FBI had information to suggest that the Trump campaign "communicated with suspected Russian operatives to possibly coordinate the release of information damaging to Hillary Clinton's campaign." The congressional intelligence committees and the FBI are investigating whether anyone on Trump's campaign colluded with Moscow during the election to undermine Hillary Clinton as part of their probe into Russia's election interference. The FBI may be taking cues from the dossier because it has worked with its author, Christopher Steele, in the past. Steele, who cultivated an extensive network of Russian sources during his time on MI6's Moscow desk, apparently worked with the FBI on Russia-and Ukraine-related matters between 2013 and 2016 — specifically with the FBI's Eurasian Joint Organized Crime Squad, according to a lengthy profile in Vanity Fair.